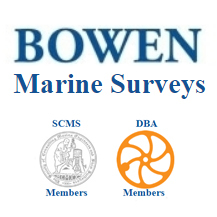 Bowen Marine Surveys are a group of three fully qualified and experienced independent marine surveyors with an engineering background, covering inland and coastal southern UK and Europe (particularly Holland and France). They are general practitioners but specialise in vintage steel hulled vessels; the main focus of the business is narrow boats (new as well as vintage) and barges (of all types but particularly those of Dutch origin). Recognised qualifications held are YDSA, SCMS, I Mar EST and IIMS.